There were mixed emotions for M-Sport as Rallye Monte-Carlo came to a close today. Bryan Bouffier secured a sensational second place behind the wheel of an M-Sport run Ford Fiesta RS WRC and Elfyn Evans got his FIA World Rally Championship (WRC) campaign off to a flying start with sixth place on his Monte debut. Elsewhere however, there was disappointment for Mikko Hirvonen as his Ford Fiesta RS WRC developed an electrical issue on the final stage – relegating the Finn from the overall results. This year’s event has seen some challenging conditions, and as the crews ventured south to Monaco, the final day was to be no different. As one of the WRC’s most legendary stages, ‘Col de Turini’ is one which rarely fails to excite, and this year’s offering certainly achieved that. 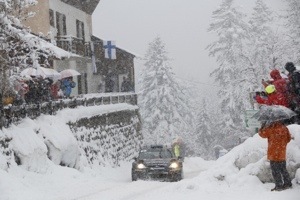 With full snow over ‘the Col’ for ‘La Bollene Vesubie – Moulinet’ and streams of running water for the high-speed ‘Sospel – Breil sur Roya’, the final loop of stages were amongst the event’s most daunting. But that was not to faze Evans and co-driver Daniel Barritt as the British duo equalled their best performance on what was their maiden outing at the season’s traditional opener. Taking to the wheel of the Ford Fiesta RS WRC, the Welshman was one of the event’s most impressive contenders. Keeping his head where the more experienced faltered, Evans showed the determination which will see him go far in years to come. Gaining a wealth of invaluable experience through the treacherous speed tests, the 25-year-old also demonstrated flashes of brilliance – with a fourth fastest time on SS11 and being just 0.5 seconds shy of a WRC stage win on SS3. Unfortunately, there was less good fortune for the sister M-Sport World Rally Team Fiesta RS WRC of Hirvonen and co-driver Jarmo Lehtinen. In what had been a difficult transition back to their former team, the Finns had to adapt in less than ideal circumstances. Upping the pace as the event ensued, the Finn was on course for a strong sixth place before an untimely electrical issue put pains to his efforts on the final stage. He and the team made every effort to get the Fiesta back to service. Determined to the last, Hirvonen even removed the windscreen to improve visibility in the lashing rain having lost power to the wipers. Regrettably, it was not to be. As his hard work went unrewarded, Hirvonen had to accept some good mileage in difficult conditions as his only consolation. The Finn now focusses his attention on a successful Rally Sweden – an event on which he has previous good form having claimed victory with the team in 2011. “I’m absolutely delighted to have made it to the finish in such a strong position. Obviously it is very disappointing for Mikko [Hirvonen], he and Jarmo [Lehtinen, co-driver] helped us a lot this weekend and sixth place should have gone to them. “We managed to keep our noses clean all event – no moments, no dramas, no big slides. To drive round a tricky event like this, like we did, it is a big achievement for us and it fulfils everything we wanted from the weekend. “It’s been a fantastic start to Elfyn’s [Evans] WRC campaign and he richly deserved this sixth place finish. He has coped well in one of the most difficult Montes for number of years and it sends out a strong message that he has a great career ahead of him. “Obviously it was a huge disappointment to lose Mikko [Hirvonen] with an electrical problem on the final stage. He and the team tried hard to get the car back home, but unfortunately it was not to be. Bryan Bouffier and Xavier Panseri secured a well-deserved second place behind the wheel of an M-Sport run Ford Fiesta RS WRC today. Constantly challenging the front-runners throughout the event, Bouffier set a string of competitive times – including two stage wins – and proved the performance of M-Sport’s top-specification Fiesta. “I have to say that before the start of the rally, it was my dream to finish on the podium. To have actually achieved it is a fantastic feeling and truly surpassed my expectations. “It was a pleasure to battle for the lead. On some stages were really pushed and it was great to see that our pace was strong enough to challenge. There was a clean-sweep of the podium for the Ford Fiesta R5 in the FIA World Rally Championship’s premier support series today as Yurri Protasov, Lorenzo Bertelli and Robert Barrable piloted their M-Sport machinery to the WRC2 podium. “A fantastic weekend for M-Sport, with second in the rally overall, was topped off with a one-, two-, three- for the Fiesta R5 in WRC2. 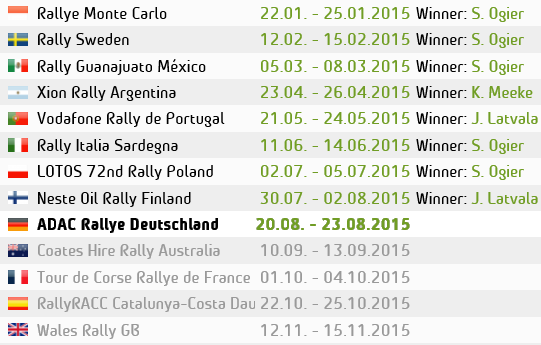 It’s been a great week of results and more proof that the [Fiesta] R5 is a top performer.